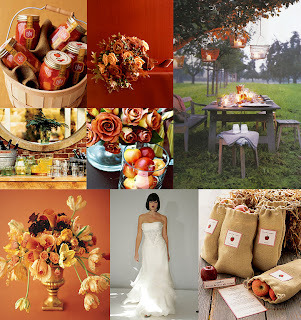 Elizabeth at Elizabeth Anne Designs created this gorgeous fall inspiration board. I love the warm colors and, as she noted, the lack of leaves. I love fall leaves but it is a pretty common item of decor when someone is aiming for the fall look. Its fun to see something that gives off the fall glow without actually using leaves. I love the hem of that gown. I also love the loose arrangement of the centerpiece and the bouquet. Thank you for the inspiration, Elizabeth! thanks for the shoutout! i might've had even more fall posts if we had actually received a fall season in chicago this year! I know! We saw a few days of it and then it was dark, cold and the leaves were gone. I can live vicariously through those photos, though!